Want to know how to wake up earlier because it's currently a struggle? You're not alone in this fight—by a long shot. I used to struggle with this. And hundreds of thousands to millions of Americans also aim to but can't wake up earlier for the life of them. So they settle for the snooze button and sleeping as late as they can before school or work. Organized, because they're not playing catch up on their day. They have built-in extra time to consider their goals for the day, week, and month. Productive, because they know what they need to do today and can attack each item on their to-do list. This also creates positive momentum that carries into the afternoon and evening. Healthy, if you capitalize on this extra morning time for a morning walk, run, or exercise routine. That will get your blood flowing to start the day and encourage you to eat healthier foods, which is a double win. Plus, a Harvard research study found that adults who wake up earlier tend to experience more positive feelings throughout the day than those who don't. And this study found these people felt subjectively healthier than the night owls who wake up later. I could write a whole article about the correlation between mega-successful people and waking up early. So by now, whether you're naturally an early bird or a night owl, I hope you're convinced about the benefits of waking up earlier. And I want to point out that there's a difference between waking up earlier feeling rested and recharged to tackle your day. Or feeling pooped out, with zero motivation, wondering when you can take a nap next. It defeats the purpose of waking up early if can't properly function in the morning and rest of the day. That's why this post is about how to wake up earlier without feeling like you're on your deathbed. That's important to starting the day as productive as possible. I figured I can't just make the claim that successful people are often early risers without backing it up with some quotes. So here are a few legends with their thoughts on the matter. There are thousands of other examples, but starting the day early helped these people get an edge in their career and not look back. I could write a post with 37 or more tips to wake up early, which works for some blog posts, but I felt it did not for this one. In this case, it's best to keep it simple and stick to the basics to overcome your fight against the early morning. Follow these three keys to waking up earlier and you just might—I bet you will—start to enjoy it. The biggest problem I notice among my friends and family is they use their phone, tablet, or laptop up to the second they want to fall asleep. Then they get upset that they can't go to bed right away, when really they set themselves up to fail. Sometimes this issue is so bad that while binging on social media or their favorite show, they'll start to daze off and drop the phone on their face or laptop on the ground. Your mind isn't meant to be firing at all cylinders in front of a lit screen and then instantly turn off to go to bed. It's not a light switch. It takes some winding down to go to bed and be rested for an early morning. So as interesting as it is to scroll through my Instagram profile, control yourself and get off of social media at least 30 minutes before bed. Maybe this means putting your phone at the opposite end of the room or leaving it out of your room. And this tip also means, to avoid the temptation altogether, not using your phone or laptop in bed during the day. This creates a bad habit that makes it acceptable to do it before bed. However, what is allowed in bed is reading a book because this will relax your body and prime your mind to fall asleep. That's one of one million reasons why reading is the best. Keep your bed a device free zone and your body will have an easier time going to bed, plus waking up early. Most people treat food and sleep the same way, they want more than they actually need. There's no need to sleep more than 8 hours to feel rested and have energy throughout the rest of the day. And besides certain seasons of life where limited sleep is necessary, there's no reason to go through weeks on 5 hours of sleep because that will limit your performance during the day. When you sleep more or less than you need to, you through off your body's clock and make it difficult to wake up on time. It's also impossible to get in a routine. That's why moderation is key here. Plus, as long as you're getting 7 to 8 hours of sleep, you'll be well rested and it won't matter if you get up at 5, 6, or 7 AM. To do that, of course, you need to go to bed reasonably early at night. This is powerful for many of you, since you'll be trading the normal hours at night you would waste watching television for quality hours in the morning to do significant work and feel great about it. And this method also works on the back end. If you've been busy and working hard for 16 or 17 hours during the day, your body will be ready to fall asleep at night. You're not putting yourself in position to wake up early if you get out of bed at 6 AM, some days 8 AM, and others at noon—depending on the day of the week. Your body will be insanely confused, and get worse REM sleep because of it. Again, keep it simple by waking up at the same time each day. Following this tip inherently includes going to sleep at night at the same time each day, so you get your 7 to 8 hours of sleep. This won't be bad during the week. Though this may mean you have to sacrifice late nights out with your friends on the weekends to keep your wake up routine going strong. With that said, this doesn't mean you can't break this rule every once in a while for a social night out. But I'd say that 95% of the time you need to be waking up at the same time each day to get this momentum going in your favor. Otherwise you're just placing struggles in your way, like hitting snooze and tricking your body, which make it more difficult to stick to this game plan. It's easy to say you don't know how to wake up earlier when you haven't put in the effort to try to do it the right way. If you do it wrong, you will feel like you got hit by a train in the early morning. So use the three action steps above and give it a genuine effort. I'm not going to lie. It will be uncomfortable in the beginning as your body adjusts to its new routine—just like anything else. But over time it will feel normal and your body will get better sleep because of this regular routine. And most importantly you'll pick up the benefits I mentioned earlier, like becoming more organized, productive, healthy, and joyful because you woke up earlier—that all sounds like success to me. Maybe this extra time in the morning is the difference that helps you reach your goals or New Year's resolutions. Anyway, cheers to becoming a morning person. And a more successful one at that! 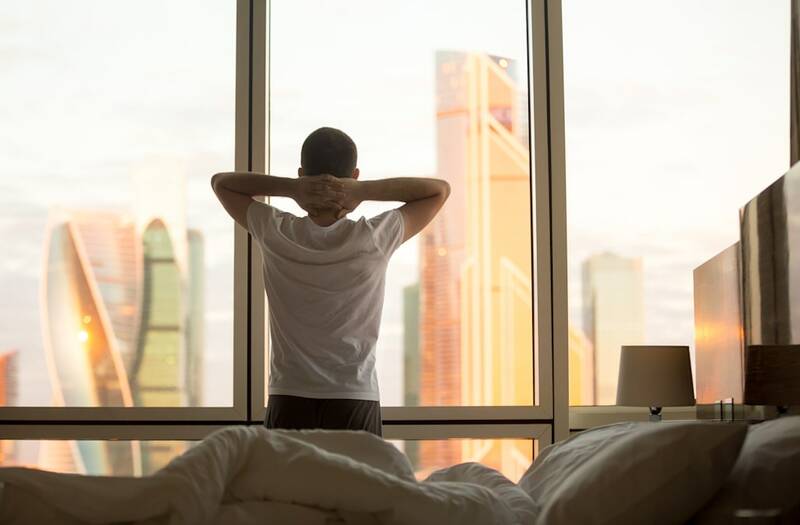 The post 3 Ways To Wake Up Earlier Without Feeling Like Death appeared first on Take Your Success. The more coffee you drink, the less effective caffeine becomes as a stimulant. Taper your coffee intake to optimize the effects of it's caffeine when you really NEED it! Drink water before going to sleep. By hydrating before you go to sleep you not only pump some well-needed H2O into your body, but also almost guarantee that you'll have to wake up in the morning if for no other reason than needing to use the restroom. It'll be nearly impossible for you to sleep in! We know you've heard this a thousand times, but staying fit and healthy generally leads to a better sleep cycle. And a better night's sleep will lead to a happier, early morning for you! Try tracking your sleep activity and fitness with a watch like the iHealth Wireless Activity and Sleep Tracker (AM3). It'll help you know when you've gotten a good nights sleep. Practicing a pattern of routine before bedtime will help you in the long run. Get yourself in the habit of a nightly and morning routine to save yourself the pains of switching back and forth between schedules. Give yourself enough sleep time. You know you need at least seven to eight hours of sleep a night! Don't try to fool yourself. Waking up will be easier if you've gotten your necessary snooze time. We all understand incentives, right? Well, a great morning incentive is waking yourself up to your favorite breakfast food or drink. Better yet, both! Make yourself comfortable in the morning-- get yourself out of bed. Place your alarm clock away from your bed. That way you can avoid getting angry and smashing it with a hammer, or, bare minimum, hitting that pesky snooze button. By placing your alarm clock across the room, you've got to get up to turn it off-- no point in laying back down after that! Now, this may not motivate you to get OUT of bed, but it will probably make you feel a bit more rejuvenated for the day. Try this small trick and see if it works for you. Invest in an alarm clock that works for you. If you REALLY can't motivate yourself with a regular alarm clock, you might need to invest in something a bit more high tech, like the Zadro Natural Wake Up alarm clock. It uses a light that naturally gets brighter in the 60 minutes leading up to your wake up time, acting like the sun. You can also choose to wake up to typical alarm sounds or some more soothing ones, depending on what gets you out of bed in the morning. It'll save you time and effort in the mornings, giving you more time to make those pancakes we mentioned earlier. Power down electronics before bedtime. Removing the screen at a reasonable time will help your body realize it's time for sleep, i.e. it's actually dark! Also it'll motivate you to go to bed sooner because you'll have less to do (hopefully!). Add meditation to your morning routine. Take the time to collect your thoughts, breathe deeply, and relax before your start the day. Many will find that this quiet time is calming and something to look forward to in the mornings. Stay away from alcohol the night before. We all know that drinking heavy amounts of alcohol before bed time messes with our sleeping patterns. If you're truly dedicated to getting up feeling refreshed and awake, avoid late night wine and beer binges. Keep your blinds up or partially open to let in natural sunlight. This is especially motivating for east-facing windows. The gradual sunrise is a gentle way to ease your way into the morning. Shower as soon as you get up. Taking a shower immediately after you wake up is a good practice. Use aromatic body wash to wake up your senses and switch between hot and cold temperatures to jump start your circulation.